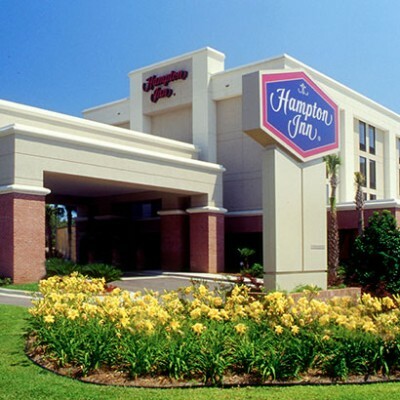 Our Hampton Inn Hotel Pensacola-Airport (Cordova Mall Area) hotel in Pensacola, Florida, boasts an ideal location in the heart of the Cordova Business District and is about 500 yards from Pensacola International Airport (PNS). Enjoy history and recreation when you visit our coastal city, and take advantage of our free shuttle service to the airport, Cordova Mall and area businesses. Discover 52 miles of exquisite shoreline offering gorgeous white sand with emerald-green water, located within minutes of our Pensacola hotel. Investigate the past at the Historic Downtown Pensacola, our eclectic Arts scene, or visit the National Museum of Naval Aviation, one of the largest air and space museums in the world. Enjoy a warm welcome and friendly service at our hotel in Pensacola, Florida. Make yourself at home in a comfy guest room featuring a 42-inch HDTV, mini-fridge and microwave. Catch up with work using the free high-speed wireless internet access and handy lap desk, or get some rest on a clean and fresh Hampton bed®. Wake up refreshed and start your day right with Hampton’s free hot breakfast. Indulge in our famous waffles, or if you’re in a hurry, take a free Hampton On the Run® Breakfast Bag, available Monday through Friday. Stay connected in our free business center and host a meeting in our boardroom or meeting room. Enjoy a relaxing swim in our outdoor pool and work out in the fitness center at our hotel in Pensacola, Florida. Make a splash in the Gulf Coast waters or jump into the history of Pensacola. Fun things to do in Pensacola, Florida are all within minutes of the Hampton Inn Pensacola-Airport (Cordova Mall Area). Experience the white-sand beaches and the many wonders of the Gulf by boat, jet ski, swimming, or by relaxing. Our hotel in Pensacola, Florida also affords you easy access to diving adventures. View sunken ships or explore the Gulf’s newest artificial reef, The Mighty Oriskany – a sunken naval aviation carrier. Take a ferry to visit Fort Pickens, a former Civil War fort that once served as a jail for the legendary Chief Geronimo. Get a taste of the local culture with events such as the Pensacola King Mackerel and Cobia Fishing Tournament, the Foo Foo Festival and the Great Gulf Coast Arts Festival.